Length: 5-8mm with a wingspan of around 13-15mm. The thorax is grey with 4 dark stripes. The abdomen is buff-coloured and occasionally transparent. The larvae are white and taper to a point at the head end. 10 – 12mm long when mature. Adult life of 1-3 months she is capable of producing 4-5 batches of 100-150 eggs. The eggs hatch in 8 – 48 hours, the maggot larvae burrow away from light, after 3 moults reach maturity at a length of 10-12mm.The full cycle is generally completed between 1 and 4 weeks, depending upon temperature and food sources. 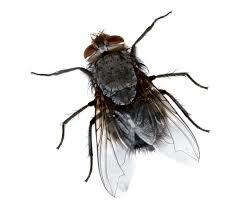 In warm environments houseflies remain active and reproduce throughout the year. Found in almost all types of human habitations throughout the world. Breeds in moist decaying food matter. Taste-sensitive cells are located on its feet as well as on its mouthparts. The adult fly transmits disease by contaminating food with disease organisms it has picked up on its hairy legs or has ingested and then regurgitated. It is often a carrier of such diseases as typhoid fever, cholera, dysentery, trachoma, and anthrax.